The scale of therapeutic and learning needs for every special needs population both children and adults are immense. No single model has proved to be completely effective. A multi-modal approach to therapy is required. The integration of holistic and innovative practices in the prevailing treatment protocols is the need of the hour for improving existing services. ABT, through the language of arts integrates holistic and innovative practices and unlocks dormant potential in each one who comes through its doors. 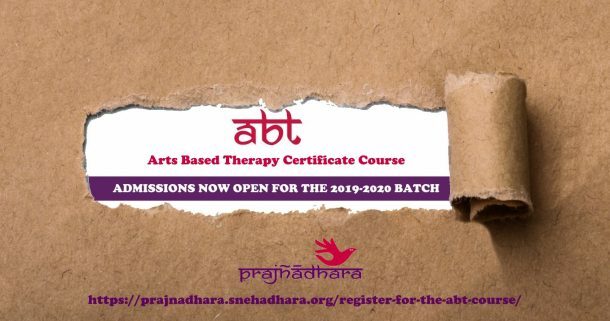 Action Research projects at Snehadhara have proved the efficacy of ABT across the special population be it in the motor, sensory, social or cognitive domain.Although India has longstanding traditions of the arts in healing, it has not been systematically and consistently developed into an indigenous practice in the contemporary times. ABT bridges that gap. It brings the much needed artistic language into therapy, while retaining a firm basis in Indian mind traditions, Eastern Psychology and well-researched scientific understanding of mind and reality. Demonstrate understanding and specific practice in the area of the arts and healing.